For more than thirty years, Frederick Kirschenmann has explored the ethical and practical principles of sustainable agriculture. An accomplished theologian, philosopher, and third-generation farmer, Kirschenmann is a dynamic leading voice in the dialogue about the challenges of modern agriculture. Cultivating an Ecological Conscience follows Kirschenmann’s personal and professional evolution as a lifelong proponent of new agrarianism. Together with agricultural economist Constance L. Falk, Kirschenmann has compiled a collection of his essential writings on farming, philosophy, and sustainability. 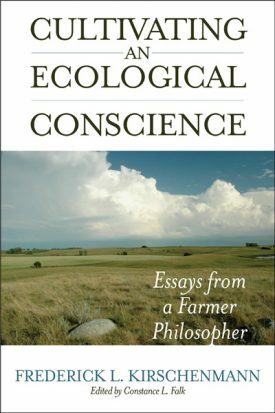 In this fascinating blend of personal history, philosophical discourse, spiritual ruminations, and practical advice, Kirschenmann shares candid, valuable insights about the agricultural challenges facing the modern world and the necessity of achieving ecologically sound and responsible stewardship of the land. This rich book follows the development of Kirschenmann’s long and distinguished career, from childhood lessons learned on the family farm to his inventive approaches for addressing contemporary agrarian issues. More than a mere retrospective, these these essays serve as an introduction to the life and wok of an extraordinary agricultural thinker. FREDERICK KIRSCHENMANN is a Distinguished Fellow at the Leopold Center for Sustainable Agriculture in Ames, Iowa, and president of the Stone Barns Center for Food and Agriculture at Pocantico Hills, New York, has published essays in many books, including Agroecosystems Analysis, Farm Aid: A Song For America, and Sustainable Agroecosystem Management. CONSTANCE L. FALK (editor) lives in New Mexico.